Wrapping up Another Great Year in Allandale! New Eateries: Does it seem like it's raining tacos? Allandale artists—enter ANA's new logo contest! And there's so much more in the December issue. 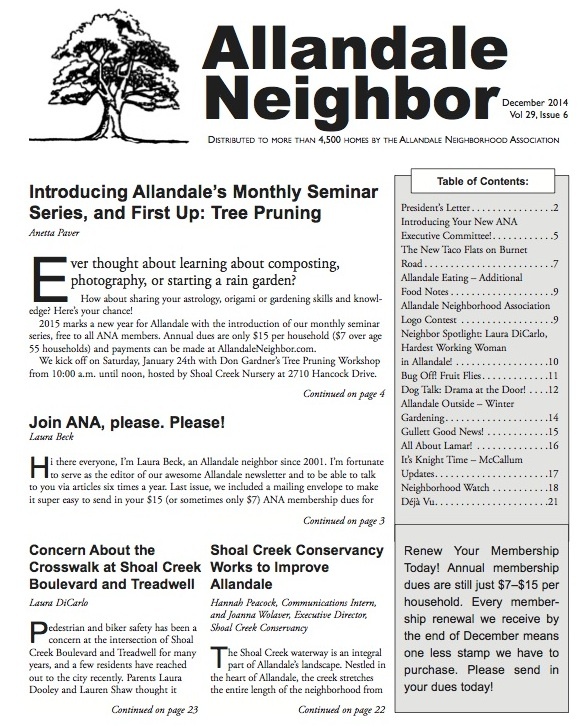 If it doesn't hit your mailbox by Christmas, email allandaleneighbor [Email address: allandaleneighbor #AT# gmail.com - replace #AT# with @ ] with your name and address and we'll deliver a copy to you. Meanwhile, to read it online, you can download the newsletter here.